Neonicotinoid insecticides (e.g., imidacloprid) are some of the most prevalent tools used to control hemipterans that attack soybean crops worldwide. However, the emergence of neonicotinoid-resistant strains of phytosuccivorous soybean pests, such as the Neotropical brown stink bug Euschistus heros, has posed a challenge to the sustainable use of these compounds. Here, we laboratory-selected two E. heros strains for imidacloprid resistance and evaluated the activity of detoxification enzymes (e.g., cytochrome P450, esterases and glutathione-S-transferases) as well as potential adaptive costs associated with resistance (e.g., in survival, fecundity and fertility) in both strains, while laboratory selection for 13 generations in a known imidacloprid-susceptible E. heros strain (ImiSusc) resulted in an imidacloprid-resistant strain (ImiLabSel) with a resistance ratio (RR) of 11.6; similar resistance levels (i.e., RR = 13.5) were also achieved in another imidacloprid-resistant strain, which was field-collected (ImiGoias) and laboratory-selected for only six generations (ImiRes). Regarding enzymatic activity, both resistant strains differed from the imidacloprid-susceptible strain only in the activity of cytochrome P450, where the ImiLabSel and ImiRes strains exhibited higher activity by 72.3% and 40.5%, respectively. Furthermore, severe fitness costs (reductions of 86% for ImiLabSel and 68.0% for ImiRes) were recorded in both imidacloprid-resistant strains. 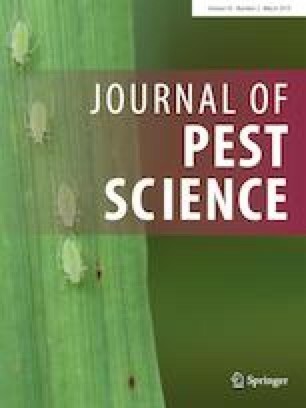 Collectively, our results showed that E. heros rapidly responded to laboratory selection for neonicotinoid resistance, with enhanced cytochrome P450 activity as the likely underlying mechanism, and that they exhibit associated fitness costs, which have direct implications for the management of this insect pest. The online version of this article ( https://doi.org/10.1007/s10340-018-1048-z) contains supplementary material, which is available to authorized users. The provision of stock colonies of E. heros by Dr. R. Laumann (EMBRAPA Genetic Resources and Biotechnology, Brasília, DF, Brazil) was greatly appreciated. This work was supported by grants from the CAPES Foundation, the National Council of Scientific and Technological Development (CNPq), the Goiás State Research Foundation (FAPEG), the Minas Gerais State Foundation for Research Aid (FAPEMIG) and the Special Research Fund (BOF) of Ghent University (Belgium). All applicable international, national, and institutional guidelines for the care and use of animals were considered in the present investigation. The eight authors of this manuscript accepted that the paper is submitted for publication in the Journal of Pest Science, and report that this paper has not been published or accepted for publication in another journal, and it is not under consideration at another journal.